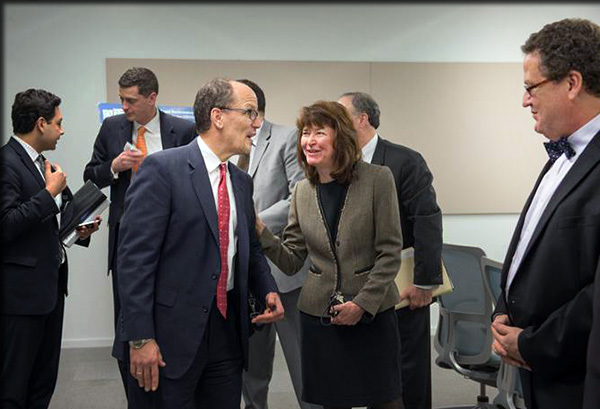 ESF President Quentin Wheeler, right, meets with U.S. Secretary of Labor Thomas E. Perez and Amy Casper, CEO of Ephesus, during an announcement in Pulaski regarding the Ready to Work Partnership. The U.S. Department of Labor has announced the availability of approximately $150 million in grants to prepare and place those facing long-term unemployment into good jobs. TheReady to Work Partnership grant competition will support and scale innovative partnerships between employers, nonprofit organizations and America's public workforce system to build a pipeline of talented U.S. workers and help those experiencing long-term unemployment gain access to employment services that provide opportunities to return to work in middle- and high-skill jobs. Approximately 20 to 30 grants ranging from $3 million to $10 million will be awarded to programs focused on employer engagement, individualized counseling, job placement assistance, and work-based training that facilitate hiring for jobs where employers currently use foreign workers on H-1B visas. "These grants are part of President Obama's call to action to help ensure that America continues to be a magnet for middle-class jobs and business investment," said U.S. Secretary of Labor Thomas E. Perez. "We need to do everything we can to help employers expand and grow while at the same time remembering that those who have been out of work through no fault of their own deserve a fair shot." Secretary Perez made the grant announcement from the Pulaski, N.Y., headquarters of the Fulton Companies, a global manufacturer of industrial and commercial heating systems. Thanks in part to federal funding from the multi-agency Advanced Manufacturing Jobs and Innovation Accelerator Challenge, Fulton developed strong training partnerships with the State University of New York College of Environmental Science and Forestry, the Manufacturers Association of Central New York, and the Syracuse Center of Excellence in Environmental and Energy Systems. Together, they were able to develop the local workforce Fulton needed to expand the manufacturing capacity of its Pulaski plant to better serve the North American and overseas markets. Programs funded throughReady to Work Partnership grants will use on-the-job training, paid work experience, paid internships and Registered Apprenticeships to provide employers the opportunity to train workers in the specific skill sets required for open jobs. Programs will have to recruit those who have been out of work for six months or longer and will incorporate a strong up-front assessment, allowing for a customization of services and training to facilitate re-employment. As a pre-condition to be considered for funding, at least three employers or a regional industry association must be actively engaged in the project. The grants are financed by a user fee paid by employers to bring foreign workers into the United States under the H-1B nonimmigrant visa program. Prospective applicants are encouraged to view additional online resources at http://www.doleta.gov/readytowork. Any organization that meets the requirements of the solicitation may apply. The Solicitation for Grant Applications, which includes information about how to apply, is available at http://www.grants.gov. - Courtesy of the U.S. Department of Labor.